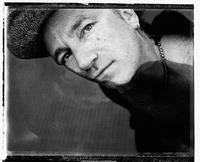 By the way, Bono’s trailing behind J.K. Rowling in Time’s ‘Person of the year’ poll. Can’t have that now, can we? Get cracking. The Terrence Higgins Trust has kindly supplied us with Helena Christensen’s portraits of Bono and The Edge, which are being auctioned to benefit the trust, a leading HIV and AIDS charity in the UK.